You're searching for a truly unique client appreciation gift. We feel your pain and are glad you finally found us. We've done the searches: business gifts, client gifts, customer gifts, corporate gifts, project completion gifts. Like you, we found page after uninspired page of promotional products - impersonal, commercial gifts that are way more about you than they are about them. A really great customer gift will be personal, useful and above all - memorable. Make Museware Pottery your go-to business gift supplier. Choose memorable business gifts that reflect the quality of your client relationships. 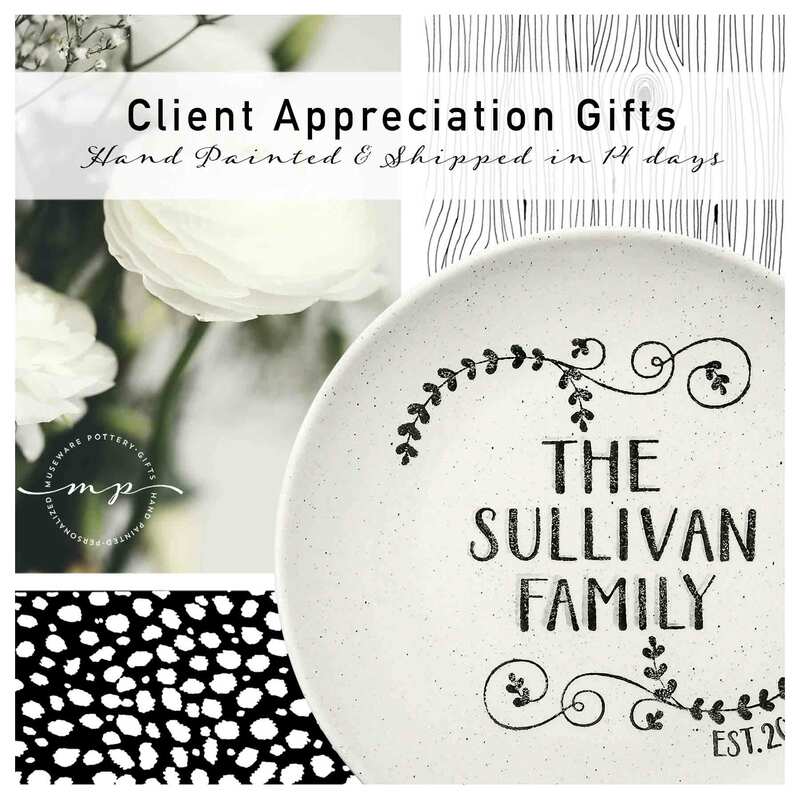 Our personalized client gifts are hand painted to order and ship in just 14 days. Short on time or wanting a fast, simple solution? Many of our best selling designs are available non-personalized and ready to ship. Contact us at 603-210-1608 for more information about our Business Gift program. Museware Pottery is hand painted on unfinished, white earthenware. Each design receives up to 5 layers of paint before being kiln fired at 1835* for up to 9 hours, resulting in a smooth, glossy, food safe finish. Our pottery is then carefully & thoroughly wrapped in Geami, a reusable, recyclable, compostable Kraft paper product. Our pottery is entirely hand made - no two pieces are exactly alike. Crooked letters, differences in pottery dimension, paint color & darkness, image placement and composition are common characteristics of each piece of Museware Pottery.